Genkai Zhang is working on representation theory of Lie groups and analysis on locally symmetric spaces. Much of the fundamental symmetries in mathematics and physics can be described in terms of Lie groups of transformations on geometric objects and their manifestations are studied using representations of Lie groups as matrices. Locally symmetric spaces are manifolds with large numbers of local symmetries. This research is mainly to understand the geometric and analytic properties of the spaces such as variations of their shapes, their resonance frequencies and quantum states, to discover and eventually classify unitary representations. Recently Genkai Zhang has been working on branching rules in representation theory, which is also called symmetry breaking in physics. 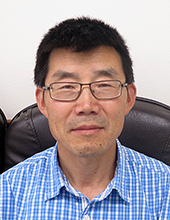 Genkai Zhang has collabrations with colleagues inEurope, China, Japan, South Korea and USA. Radon, cosine and sine transforms on Grassmannian manifolds. Radon transform on real, complex, and quaternionic Grassmannians. Hua operators and Poisson transform for bounded symmetric domains. Nonsymmetric Jacobi and Wilson-type polynomials. Laplacians on quotients of Cauchy-Riemann complexes and Szegö map for L2-harmonic forms. Tensor products of holomorphic representations and bilinear differential operators. On the Faraut-Koranyi hypergeometric functions in rank two. Analysis on symmetric and locally symmetric spaces. Representations of Lie groups. Radon transform. Harmonic and Complex Analysis on symmetric spaces. Representations of Lie groups. There might be more projects where Genkai Zhang participates, but you have to be logged in as a Chalmers employee to see them.